Note: This article was mainly prepared for one person and is not intended to be a complete history of the town. Also, most of the information comes from the book "Maxwell Nukumaru 1998, A History of the Districts" written by George ABBOT. The reason why the town was started, or named is not known. However, like many New Zealand towns that have a Maori name, it is likely that Nukumaru was named after a Maori Pa (town) that was in the area. European settlers, mostly English, but also included some Chinese in later years started to arrive in the 1840's. The area was deemed suitable for farming, and for growing of crops as the land covering South Taranaki to just north of Wanganui was rich and fertile, and not too hilly, although parts of the area had thick bush. Farming was the main use of the land then, and it is still now, most of it is dairy, as there is a large milk factory in South Taranaki. Even though the area was first occupied in the 1840s, the first piece of land wasn't sold by the Maori's to anyone until 1859. Nukumaru was a happening place about the turn of the century and right through to the 20's, but only sparse evidence of it remains today - a few converted outbuildings, one solitary, relocated railway dwelling. A Post Office directory published in the 1900's described it as a "rail flag station 264 feet above sea level, which serves the extensive district better known as Maxwelltown. Nukumaru has a population of 90, while the Maxwelltown settlement has 153." Nukumaru did not get its own primary school until the end of World War One, but the directory reported that a public school (Maxwell) served the dual district and had 75 youngsters on the roll. Another reference document told inquiries Nukumaru settlers "have no small hopes of the bright future for this, the very cream of this far-famed Waitotara Block." Until towards the end of the 1860's, very few people were in the area because there were a number of problems with the local Maori's and it simply wasn't a safe place for Europeans to be. In late 1864, a large contingent of the Colonial Force moved into a woolshed where what remains of the current town is. The shop and hotel that was in the area for a long time probably opened about this time to help The Colonial Force which numbered about 100 men at the time. Problems with the Maori peaked in January of 1865 when one of the famous land battles in the Taranaki/Wanganui area happened one Sunday afternoon which resulted in about twenty percent of the Colonial Force being killed and a number of others injured. It wasn't until 1870 that it became safe for people to travel in the area without any risk of anything happening to them and Cobb & Co (a famous New Zealand company which provided a passenger service in the country in the 19th century until more modern forms of transport become available) completed their first journey from Wanganui to Hawera in what would become the first of a regular passenger service between Wanganui and New Plymouth. When Cobb & Co made their first stop in Nukumaru, all that was in the town was a few houses, a general store and a hotel. Both business's providing goods and services to passengers on their stop and to local farms. The main problem with the development of the town is that there were no proper roads in the area making travel slow and difficult. And the first proper road through the town, although only a dirt track wasn't put in until the 1890's. However, the provincial government in 1870 decided that a railway link between Wanganui and New Plymouth was required. Work didn't start on the line for a few years, but when it did, work on the track commenced at both ends, and met in the middle, somewhere south of Hawera. The line between Wanganui and Waverly was completed in 1878, and the complete line between Wanganui and New Plymouth was finished in 1881. As the train service was quicker and more comfortable, the Cobb & Co Coach service would have stopped around this time. The Nukumaru train station probably had a part time station master, but there were no passenger or freight facilities at the station. Trains only stopped if there was something, or someone to pick up or drop off. Although Maxwell had some freight facilities at that station, it was the same as Nukumaru, trains would only stop to pick something up or drop something of. The last regular passenger train between Palmerston North and New Plymouth would have been in the late 1960s, or early 1970s at the latest and the station would have closed at this time. The station and freight facility at Maxwell was closed in 1978. Partly due to the transport difficulties, mail deliveries to Nukumaru did not start until 1872, and it was only delivered to the general store, so people had to go to the store to pick it up. However, the store did start delivering mail in the early part of the 20th century, but only three days a week, and only if the customer wanted groceries delivered as well. It took even longer for phones to arrive. In the 1950s, there was only one exchange in the area, which was a manual exchange and only could handle thirty lines. Most of these lines were party lines, which meant that people had to share the phone. Very few could afford to have their own telephone line. And every call was charged for, regardless if there was no answer at the other end. And what didn't help with the exchange is that it was only open during normal business hours. After hours, weekends, and on public holidays, the exchange was closed, which meant that people could not make calls at these times, nor could they receive them. It would appear that there have only been two businesses in Nukumaru, the general store and the hotel. Not much was detailed about the general store, but it almost certainly had just about everything that people needed in the area. And the general store also doubled as the post office. In 1870, the hotel was owned by William Handley. In 1871, the hotel was completely demolished due to fire, and nearly destroyed the general store as well. It was quickly rebuilt, but fire destroyed it again soon after. There have been a number of other occasions in which the hotel was completely destroyed by fire. Also, men working on the railway stayed at the hotel. The last hotel on the site, along with the general store, probably closed about the time passenger trains stopped passing through town, and the hotel building was abandoned. The town hall was finished and officially opened in 1926 and particularly during the depression of the 1930�s it was a popular venue for various functions. Due to its small size, it wasn�t unusual for people to be turned away as there wasn�t enough room for all of them. Nukumaru did not get its own school until just after the end of World War One. Until this time, most children caught the train to Waitotora, and then walked the 6 kilometers from that station to the school there. The school eventually started in 1918, but did never have many pupils and finally closed in 1965 due to insufficient numbers. A complete roll for the school does exist, but not for the teachers who taught there. The school was located between the highway and the railway line. After the closure of the Nukumaru School, most of the pupils went back to Waitotora School, which is still open. However, the school records went to Maxwell school. It is also likely that before the school opened, and after it closed, some children from the area did go to Maxwell. Records for Maxwell school prior to 1926 are incomplete as a fire in the school destroyed all the records. Closer to home, a more significant geographical feature is the Nukumaru Fault Zone. Although its southern extremity is in the Cook Strait seabed, it emerges on dry land a couple of kilometers north of Maxwell, where the shoreline was located thousands of years back. This Nukumaru Fault runs slightly east of north and generally in a straight line onto Paparangi Country. The zone is roughly 600 meters wide and has a "throw" of some 150 metres. Nukumaru was never a large town, and like a number of smaller towns, as modern technology become more accessible, fewer people were needed to work larger farms, and along with the removal the train service, the population has steadily been declining as people moved to the city to look for work and the town has eventually disappeared, although there are still a few houses in the area. 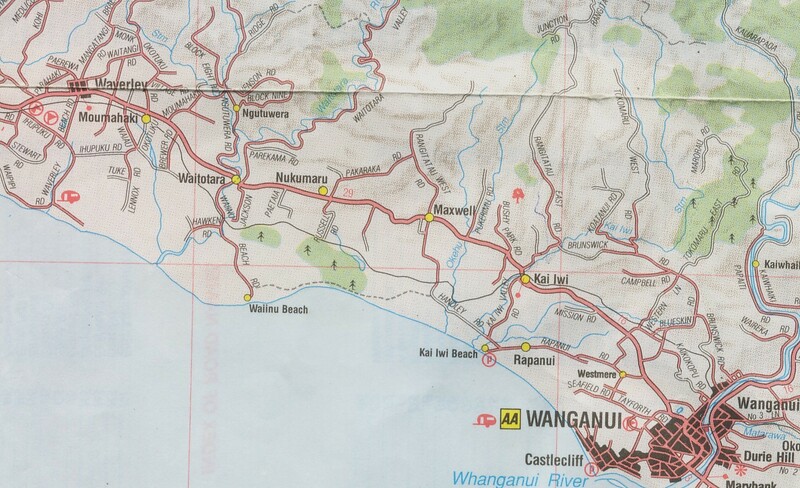 Below is a map of the area and Nukumaru can be clearly seen in the middle, approximately halfway between Waverley and Wanganui. Other places mentioned in this report are Maxwell, which is to the right of Nukumaru, and Waitotara, which is to the left of Nukumaru. South of Nukumaru is Russell Road and on the map at the end of this road is a black line which is actually the railway line. Another point of interest on the map is the road coming out of the Maxwell heading south. This is named Handley Road, possibly named after William Handley who owned the hotel in Nukumaru.